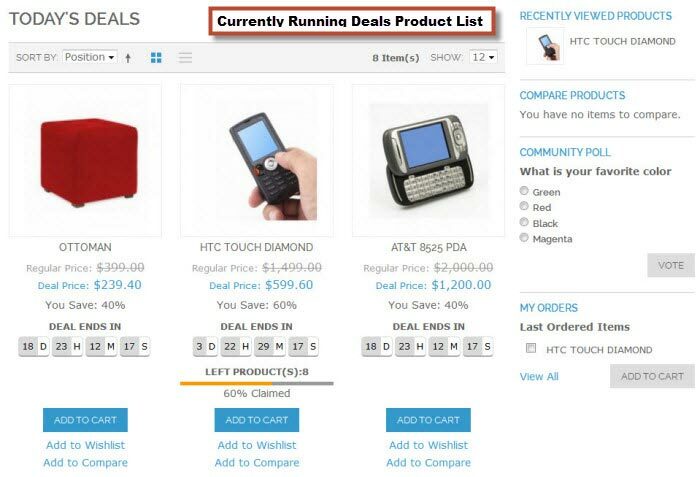 Create Today's Deals, Upcoming Deals and Expired Deals with separate template for each. Display deal timer and deal quantity bar with percentage. 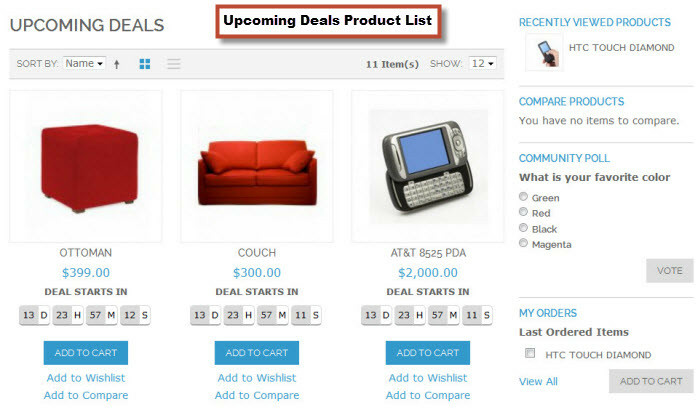 Set deal conditions based on product's sku, category or attribute set. Apply conditions for showing products into Daily Deals section. Schedule deals on multiple products with priorities. 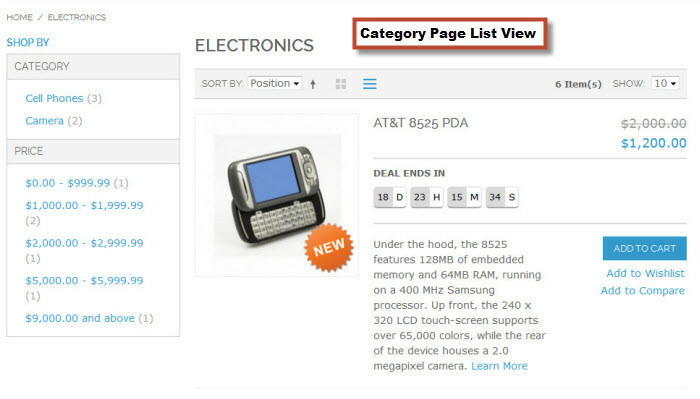 Set deal stickers on category listing and product detailed page. 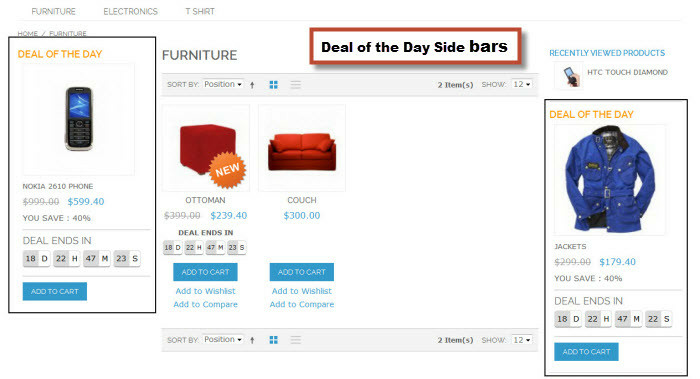 You can also set Deal of the Day products to sidebars. 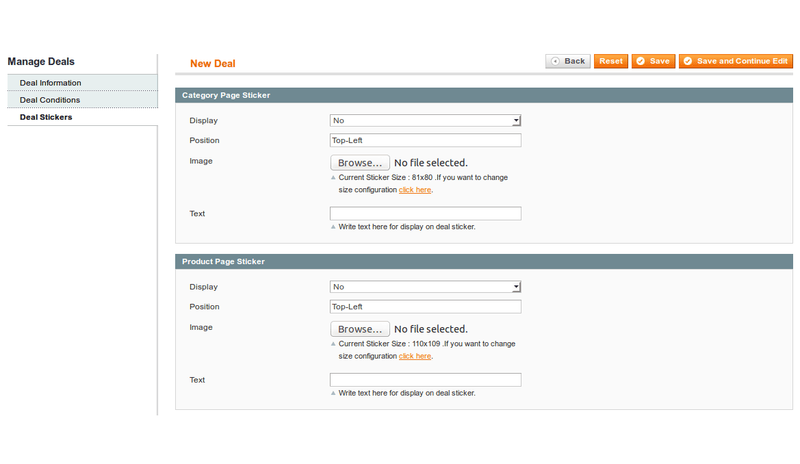 Customize text of Deal Section from admin. You can set Top links for Today's, Upcoming and Missed Deals. How to make customers shop more? How to ensure repeat orders? How to promote daily deals on your store? 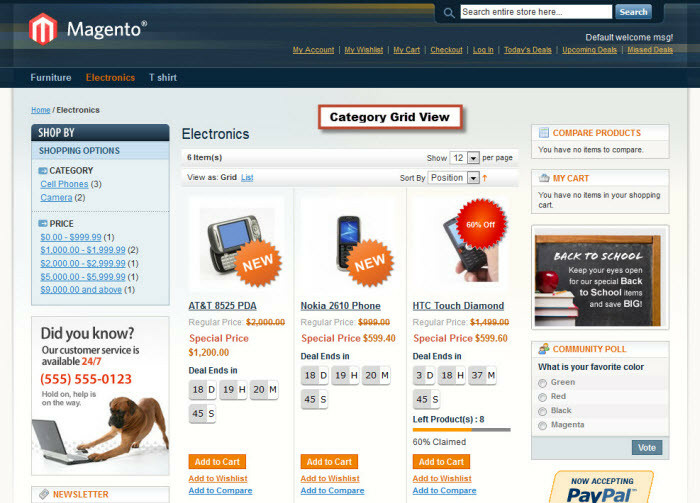 Well, there is one Magento extension to solve all your troubles. 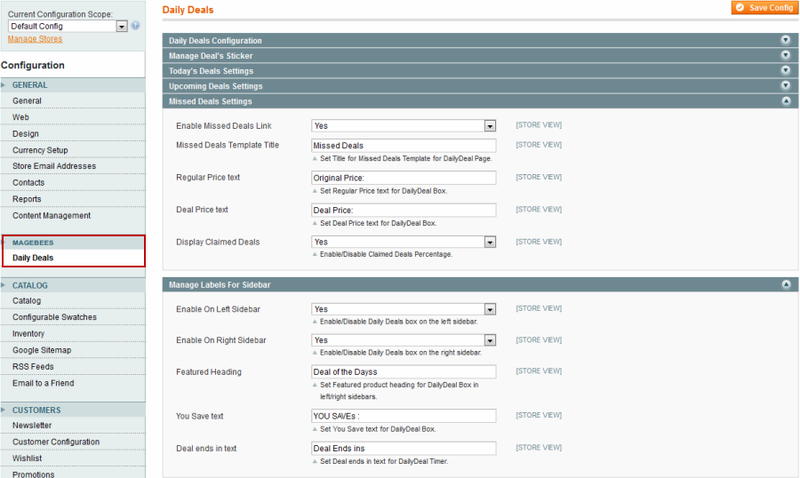 Use Magento daily deals extension and create multiple limited-time promotions for your website. Choose a single product or create flash sales for multiple products and categories, the choice is yours! 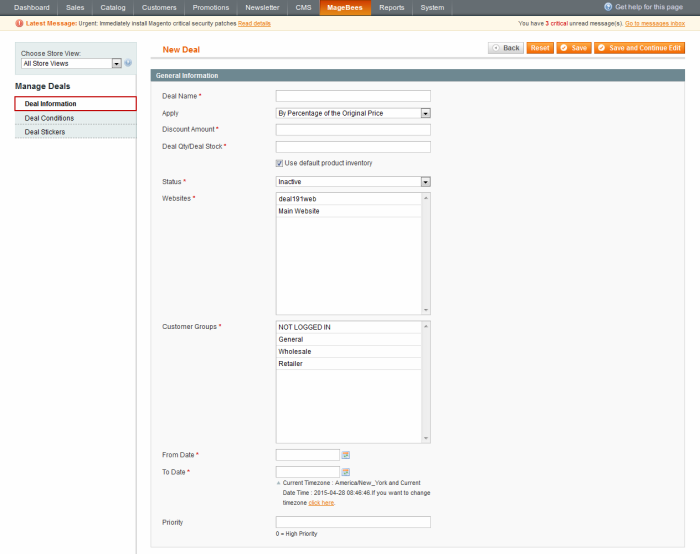 Manage all deals and promotion from one admin panel and stay on top of sales data. It doesn’t get better than this! 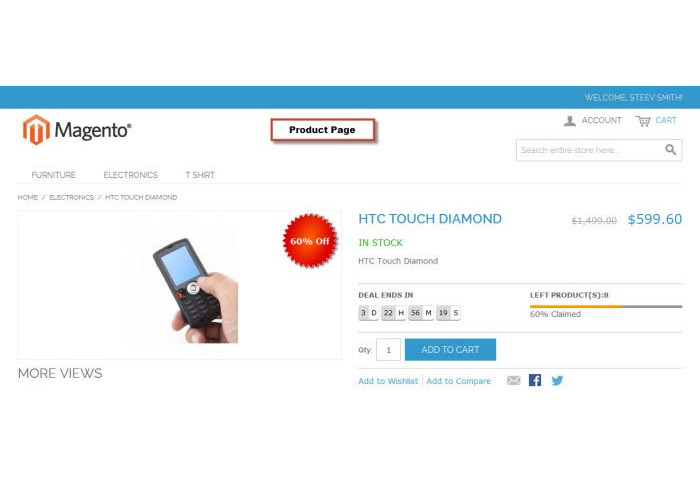 Use the extension to manage stickers on product listing and product detail page. Customize daily deals by showing product images, discounted price, quantity in stock and a ticking timer to encourage customers to shop more. 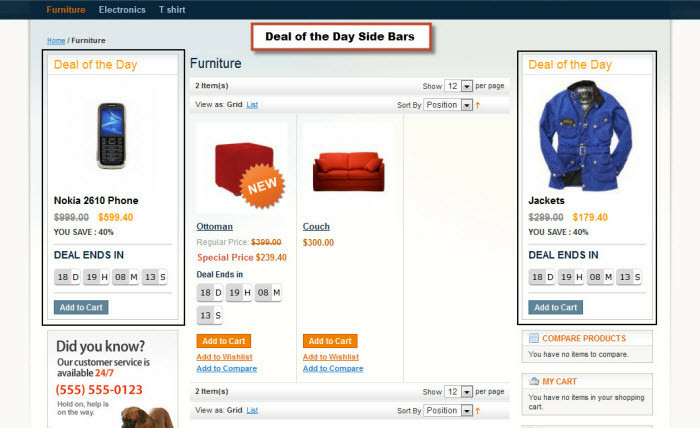 How Magento Daily Deals Extension Works? You can set sticker's position and text. You can also upload sticker image. Extension works perfect and support is really great. I recommend this plugin. I would give a 5+ star rating to this magnificent expansion. Daily Deals expansion magento works superbly and I am astonish by the brief backing gave by the organization.Marvelous experience. Great app, works exactly as described and for someone that doesn't have html experience, having the developer hop on the system and install it was fantastic. This Extension is really nice. We brought this extension and it is working as expected. The support provided was really awesome and very quick. 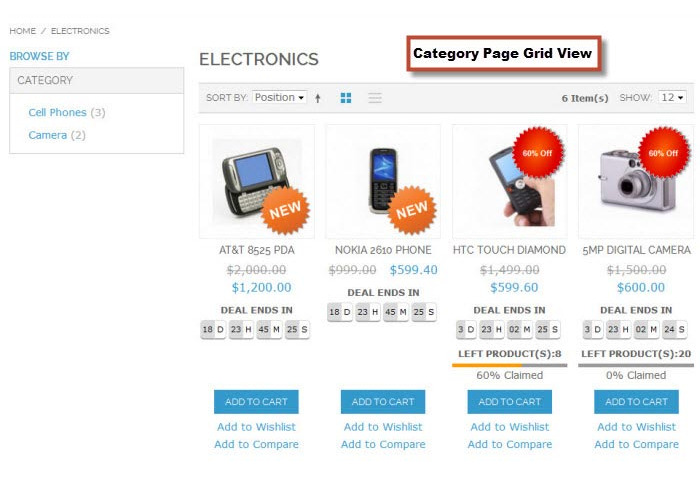 Now you can set Dynamic top link label feature for today, upcoming or missed deals from admin. 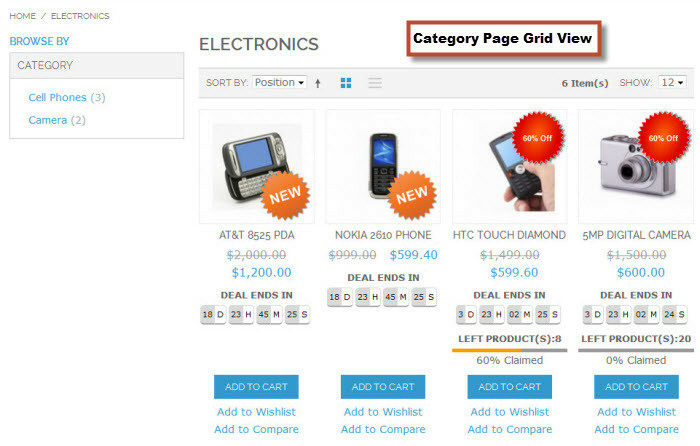 Select page layout template for deal pages. 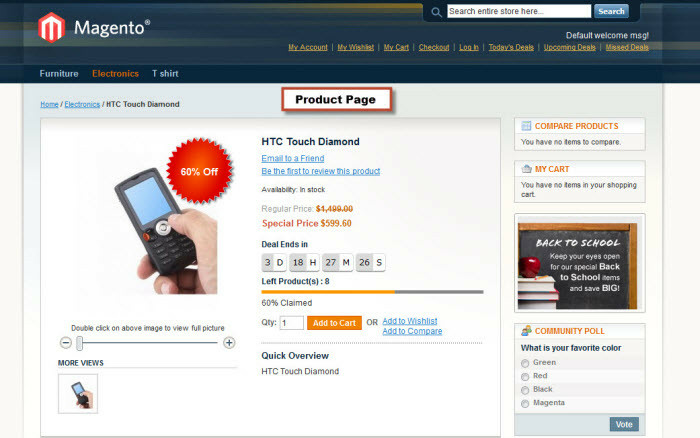 Give option for display upcoming deal timer on product page. Release stable Daily Deals Extension with many features. Q-1: I have Daily Deals Extension. But when I click on CWS Extensions -> Daily Deals -> Settings or System -> Configuration -> CAPACITY WEB SOLUTIONS -> Daily Deals , page will get a 404. :(. Q-2: Deal not auto start on specified date time, What to do? Q-3: Deal Sticker and Timer is not display. 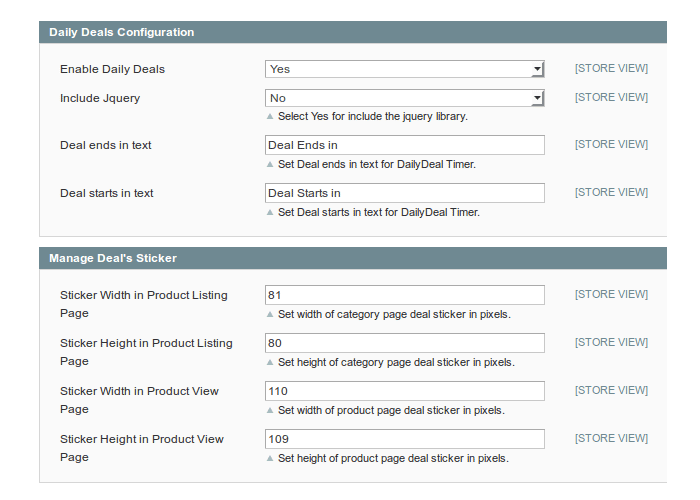 Ans : For display deal sticker & timer you have to add div as per specified in layout settings. Q-4: After adding new products there is no effect in frontend. 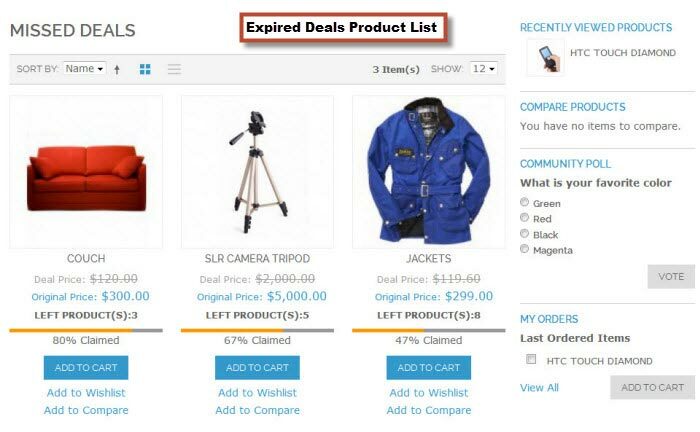 After add new products in catalog products you have to apply deal for see effect of deal on newly added product. Go to CWS Extensions → Daily Deals → Manage Deals → Click on deal for edit. Click on “Apply Deal” button. Q-5: How to Reset Deal Stock? Find "Reset Stock" button in Edit Deal screen. When you click on this you will get the following pop up. 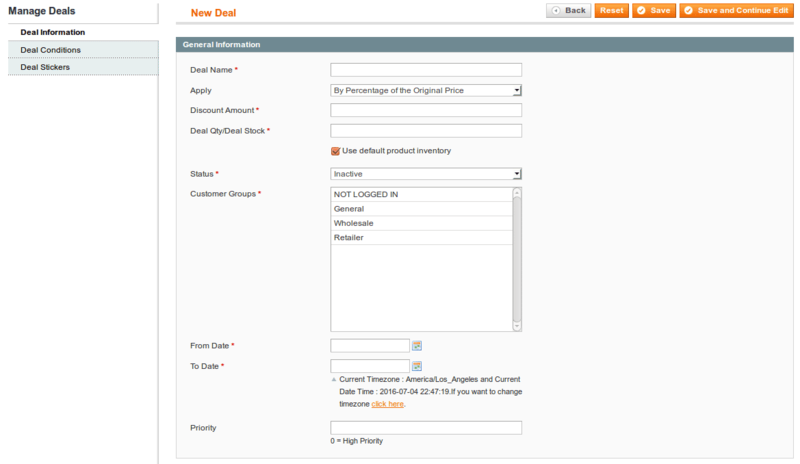 On click “Apply and Reset Stock Data!” all sold quantity records of current deal will be reset for deal quantity. Q-6: How to Manage Store wise Deal Stickers? If you have multi stores and want to manage deal stickers store wise select any store from Edit Deal screen. You will get the following screen. 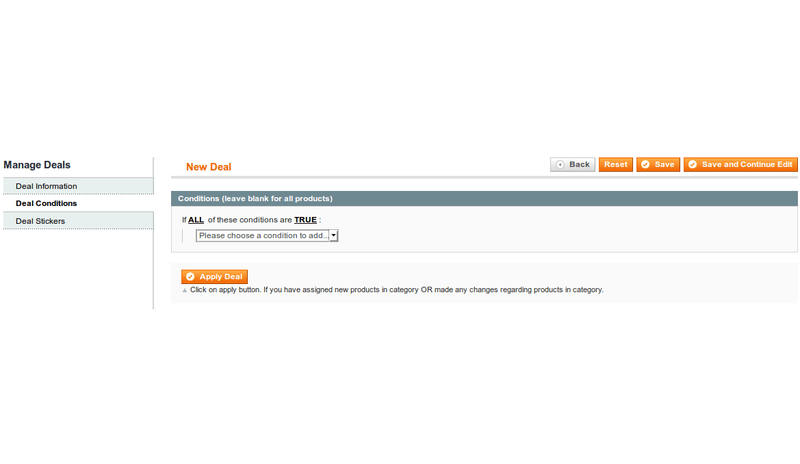 Choose “No” for manage deal sticker store wise for “Use Default Values for Sticker” Drop Down.